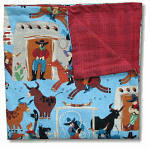 Creating A "My Cowboy Baby"
Mosey around and check out the cowboy baby gift sets, clothing, blankets, bedding, and accessories. You're sure to round up something for the young cowboys and cowgirls on your list! For your convenience, My Cowboy Baby also offers a Gift Registry/Wish List and Gift Reminder Service. And don't forget to join their mailing list so you'll always be in the know about special sales, coupon codes, and new arrivals.